The VirtualPaint training system uses the latest technologies to train current and future spray technicians without wasting time and money. 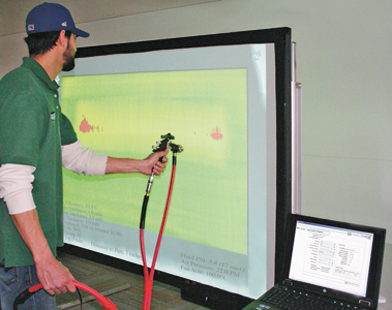 The system allows users to view and interact with real spray application equipment while simulating the actual application on to a virtual surface. The VirtualPaint software provides instantaneous feedback, determining the spray pattern distribution, film thickness, transfer efficiency, and overspray in real time. The computer and tracking system communicate to a projector, which displays the VirtualPaint canvas onto a portable rear projection screen. Features like adjustments to air pressure, fan size, fluid pressure, flow rate, partial triggering, on a real spray gun allow for the most realistic training experience. The end result is better technique, control, performance, and an incredible level of feedback to the painter.